Rubenerd: #Anime The K-On! She lives! #Anime The K-On! She lives! The web is abuzz with the news! The girls from everyone's favourite moeblob series K-On! 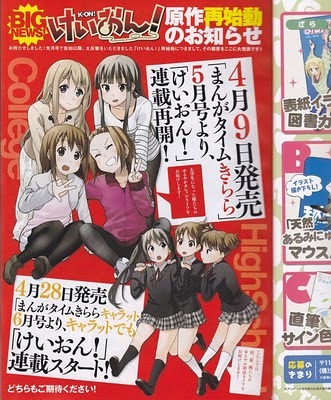 will be continuing their adventures in the covers of Manga Time Kirara, as university students. Azusa and co will also be still kicking around in Manga Time Kirara Carat forming the next iteration of the Light Music Club. Will they be punk rockers like everyone's favourite sensei, or will they be gorging on cake? Or will they forge a NEW path… one with punk rocking cake?! Time will tell. One thing is for sure, the tidal wave of negativity from holier than thou anime fans who can't accept the fact nobody is forcing them to watch or read the series will be stronger and more vocal than ever. Oh well, if it makes them happy… let them eat cake ;).